Welcome to another Etsy day!!!! 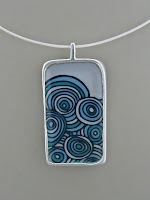 Our featured shop this week is called Marmar and he specializes in making cute & whimsical enamel jewelry. I enjoyed my *stroll* looking for my inspiration & I'm sure you will too so go and check him out! 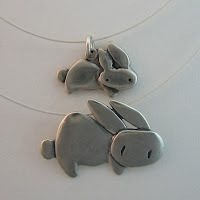 He has offered those adorable rabbit necklaces pictured above as the prize for this week's winner & since our sponsor for the week is Character Cafe; that winner will also receive 3 free digis of their choice!! How do you win? Visit the above shop, pick your inspiration, make whatever creation your heart desires & link it to the EtsyInspired Challenge Blog. Enjoy the rest of your Saturday & weekend! Thanks so much for stopping by & I'll *see* you all either Monday or Tuesday!!! WOW! This is one stunning card. Thanks for the inspiration. Mmmmmmm, this is fantastic! Definitely my fave this week! Jackie, this is lovely! I really like the dry embossed effect! I still haven't done anything like that with my Cuttlebug! Very inspiring! Beautiful! I love the embossing and focus on the pretty image. The scalloped edge adds a nice touch too! Really stunning Jackie! I love the way you embossed around the tree. Looks complicated and I love that embossing plate. Have a wonderful weekend! Gorgeous card! I love the embossed border. I have got to try that some time! Thanks for hosting the Etsy inspirations. I need to Follow so I can remember to come back here when I need inspiration jolts. OMG, what a gorgeous card. I love your embossing! This project is totally gorgeous that blue and white is just stunning and so so elegant and Pretty you really did a wonderful job on this week's project!!!! Very nice - simple yet elegant! Absolutely gorgeous. I just love the the colors and features you added. The image is beautiful. Thanks so much for such a beautiful card, it is truly an inspiration. I love the huges of blue and the beautiful layout! This is gorgeous, I love the dark blue and white. Very pretty how you embossed the background and left a space for the pretty scene. just saying Hi again - and love these cards! This is beautiful Jackie. The embossing really adds so much interest to the card. 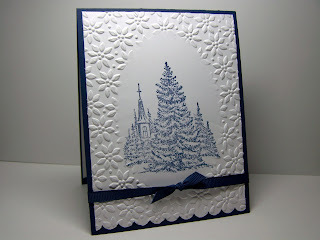 I LOVE your beautiful Christmas card, Jackie....the navy with the white is sooo classy and I love the embossed frame!!!! Hope you are getting all your Christmas shopping done....I have a little left but I can see the light at the end of the tunnel!!! Beautiful, serene, and stunning! Love it! What a gorgeous card Jackie!! Love the dry embossing and design!! So elegant and classy. Great inspired design!